This character doesn't say "ghost" or "rider". "Alien Astronaut", sure, or possibly "Extraterrestrial Baseball Catcher" but there's nothing scary or Hellish about him at all. And if that's a human skull underneath those flames, I'll eat my shorts. Look, we get a lot of motorcyclists here in the greater Durango area, but I haven't ever -- not even once -- seen someone tootling down the road on his Harley with a bright orange flight suit on. Especially not one with a gigantic zipper in the front that doesn't even go all the way down to the bottom. You put this guy on the back of a hog in any kind of actual rally and he's going to get the snot beaten out of him, flaming alien head or not. Also, Black Canary is going to be pissed when she finds out he "borrowed" her jacket. What’s with all that who-hash on the knees? 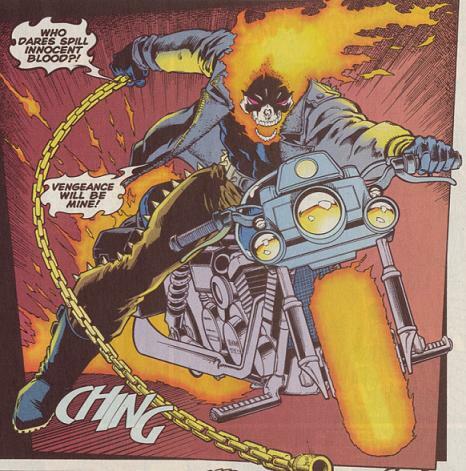 And since when are black biker’s leathers not cool enough for Ghost Rider? Maybe they were aiming for one of those jumpsuits that you see on guys who race motorcycles. Totally ignorant of motorcycle culture, but eh, it’s kind of a vague connection. Sort of. The funny thing is, when they rebooted the comic “Alien Astronaut” he looked identical to the 1970s Ghost Rider. I believe this was attempt to cash in on the Manga craze that was starting to hit in the late 90’s. And if you think the costume is bad, you should see what they did to his bike. Thankfully, the costume only lasted for 11 issuses, but the damage was done, and Ghost Rider was cancelled, only doing 4 more issues, and issue #94 not coming out until 9 years later. If it was re-colored, say black or darker tones, would it have been cool? Ghost Rider: Spirit of dance! He looks like one of MJ’s back up dancers from Captain EO. This may be the funniest string of comments to date! Gather round, friends, and I shall spin you my tale. “Before the screeching of the Bieber drove us underground, we Children of the Eighties walked along streets filled with harmonious, New Wave accompaniments. I could tell you of our Saturday mornings where we Children of the Eighties met with Smurfs, Scooby-Doo, and Spider-Man who brought along some pretty amazing friends. I wish you could have truly met them before the Remake fell upon them. Now their names read as a casualty list. Shall I speak of our leaders? And don’t get me wrong, son, I’m quite fond of He Who Is Known As The Hope and The Change, but back then it was ‘Ray-Gun’ and The Iron Lady. And they fought against The Red that hailed from the Eurasian lands. I turned away from the boy, and bowed my head in mourning. 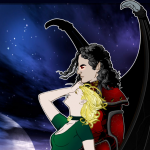 My Gods. When I saw this costume, it was so bad I fired MY tailor. Given this was the nineties, I’m surprised they didn’t change his name to ‘Gost Rydr’ or some other ‘kewl’ spelling as well. Wait, is that a small ‘Approved by the Comics Code Authority’ stamp I see in the corner? How could they approve it with this costume on the cover?! ther spiked-filled eyesore. I wonder if the pencilers ever got tired of drawing all those darn triangles! You know my favorite line out of a Ghost Rider Comic was him telling the Punisher: Beware those who seek the Ghost Rider for you may just find him. With this costume I’d have to change that line to: Beware Those who seek the Ghost Rider, for you may laugh to death when you find him. Okay, maybe it’s just me but it looks like Ghost Rider is wearing a bright orange, zip-up bustier and matching go-go boots with knee pads? Seriously, look at it. Jeff’s right, Ghost Rider would get beat up by other bikers. Here is one of my Favorite Ghost Rider Moment from I believe the 80’s Fantastic Four Cartoon. So not only do they dress GR up like an idiot, they also make him ride a Honda, man where’s the justice. Maybe he we so ashamed to ride a honda valkyrie he changed his outfit to conceal his identity. 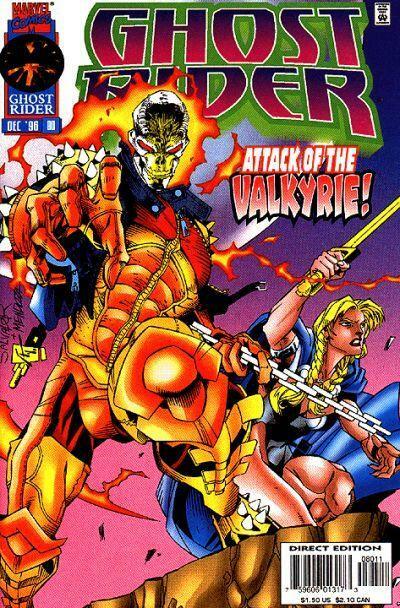 I know it was like 16 years ago, but I hope whomever thought it was a good idea to change this http://media.comicvine.com/uploads/0/4/50609-4397-66417-1-ghost-rider_super.jpg, into this http://media.comicvine.com/uploads/0/4/50689-4397-66497-1-ghost-rider_super.jpg got fired and is no longer allowed to work in comics. Even the logo stinks. Holy FRAK! Dan, is GR wearing 7/8 stalkings and a garter belt in that last picture you posted? Firing someone for that isn’t enough, whoever did THAT deserves a public lynching and quartering. @Worf, not only do they look like stalking, but orange leather ones at that. OHHH YAH SUPER MANGA GHOST RIDER GO!!!! Does anyone else notice the chain has managed to stay perfectly straight in mid air? I see from the chain that the viagra kicked in for Valkyrie’s visit. Not that it will do him any good in that outfit. Speaking of spikes in really bad places, has anyone seen Stormwatch #2, from “The New 52”? I really hated that costume.. They really should get out of the art offices more. He was I assume a BMX rider…. I now have to go put the Ghost Rider wallpaper on my PS3 to combat against this evil that Hebert has wrought!